The restaurants are alphabetically listed within the above five categories. These categories are a guideline, rather than a precise definition of the establishments. Veg Gulati offers northern Indian vegetarian dishes, such as the delicious tandoori gobhi, paneer tikka, and tandoori aloo. It is a popular, family restaurant with fast and friendly service. Next door is the sister restaurant that also serves non-vegetarian food. Defence Colony, New Delhi.Tel: (011) 464-5644. A great way to start the day is breakfast in the garden of The Imperial hotel. From the terrace, guests look out over the lush lawns and borders of the hotel’s beautiful gardens while admiring the tall palm trees along the drive. The buffet has everything one could wish for at breakfast time, from cornflakes to idlis, via bacon and eggs. 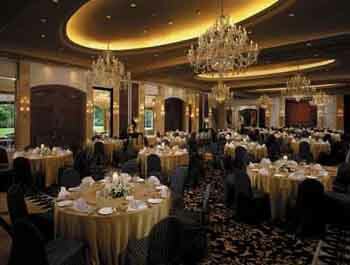 Imperial Hotel, 1, Janpath, New Delhi. Tel: (011) 334-1234. Fax: (011) 334-2255. In the centre of the Diplomatic Enclave, Lazeez Affaire is an elegant, restaurant, serving a smart, well-heeled clientele. The menu is creative and the food carefully prepared– the kakori kebab, the murg hyderabadi and the stuffed tomato are highly recommended. Diners may either sit on the floor Indian style, or at tables. 6/48 Shopping Centre, Malcha Marg, Chanakypuri, New Delhi.Tel: (011) 611-4380. Eventually there comes a time when even the most hardened enthusiast of Indian food cannot look another rogan josh or murg tikka in the eye. This is a good time to repair to Pizza Express on Connaught Place. In modern surroundings the food, which is inexpensive, will be comfortingly familiar. D-10 Inner Circle, Connaught Place, New Delhi. Tel: (011) 373-9306 or 33- 5680. In the modern Siddharth Hotel, Vaishali offers an outstanding buffet lunch, offering vegetarian and non-vegetarian northern Indian dishes. The paneer butter marsala is delicious. Diners should not be disappointed by the simple surroundings, as this represents good value. Siddharth Hotel, 3, Rajenda Place, New Delhi. Tel: (011) 576-2501. Fax: (011) 578-1016. Located in Defence Colony market, Aka Saka is a Chinese restaurant serving food that is typical of the Indian version of the Chinese culinary idiom. In Indian hands, Chinese dishes tend to be spicier and hotter than would otherwise be the case. This restaurant is more up market than some of the others, however, all are very popular. A popular restaurant in Defence Colony Market, Moet’s offers Indian and Chinese food in separate but adjacent restaurants. The Indian restaurant serves Kashmiri and Mughal specialties and a range of vegetarian dishes.The Chinese menu offers all the standard favorites. The food – particularly the murg haryali kebab or the murg achari – is good and the smart, a young clientele generates a buzz. One of several restaurants in Haus Khaz Village, The Village Bistro serves Mughal dishes, as well as some South Indian non-vegetarian specialties. 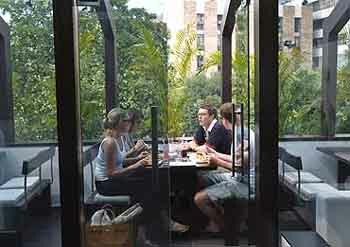 The dining room is modern and split over several levels, which provides an intimate feeling and privacy to the tables. An open air roof top restaurant in Haus Khaz Village, Top of the Village commands a spectacular view of the remains of Shah Feroz’s tomb and madrasa. In the evening, the ruins are floodlit, providing a memorable backdrop to dinner. 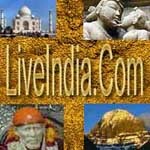 It is worth going there just for the view, however, the food – Mughal specialties, including delicious paneer dishes – is more than acceptable. Baan Thai offers exquisite Thai cuisine– some of the best in Delhi – served in fashionable surroundings. The ingredients are fresh and the sauces light yet pungent. Vegetarian and non-vegetarian dishes offer diners the customary favorites, including papaya salad, spring rolls, crisp vegetables, mushroom cake, fish cakes, tofu, satay and prawn sticks. Diners at this restaurant in The Oberoi hotel sit on the floor with their feet in a pit under the table. There are, however, standard tables and chairs for the less adventurous. Tel: (011) 436-3030. Fax: (011) 436-0484. House of Ming, in the Taj Mahal Hotel, is one of Delhi’s best restaurants offering genuine Chinese food – distinct from the (delicious) Indian version of it. The dining room is large and the atmosphere delightful. The Seafood is a specialty worth trying, despite the extra cost. Tel: (011) 302-6162. Fax: (011) 302-6070. Attached to The Oberoi hotel, La Rochelle is the finest French restaurant in Delhi, with prices to match. The chef has created an authentic French menu that will excite the most jaded palate. specialties include tart of escargot, pan-roast rack of lamb roasted morel mushroom, and pan-fried trout meuniere. It also has the most interesting wine list in Delhi, although a bottle of moderate 1999 claret costs Rs3000. Tel: (011) 436-030. Fax: (011) 436-0484. The joy of the new Marsala Art in the Taj Palace Hotel is the ‘Instant Sketches’ menu, the soi disant ‘interactive’ Indian eating experience. customers sit at a bar, behind where the chefs cook. There are three set menus– seafood, vegetarian and non-vegetarian – each with ten small dishes. Diner and chef can discuss the courses as they are served. The dining room is modern and simple, the food delicious. Tel: (011) 611-0202. Fax: (011) 611-0808. The Bukhara in the Maurya Sheraton, is widely known as the best place for Mughal and North-West Frontier specialties in Delhi. The food is delicious and lives up to its reputation– one highly recommended dish is the kastoori kebab, while the delicious dal makes a splendid addition to any meal. Customers sit on benches, at stylish low tables. The restaurant is very busy but still, the service is excellent. Tel: (011) 611-2233. Fax: (011) 611-3333. Dhaba, a popular restaurant in Claridges Hotel, serves Mughal or Northern Indian specialties. The food is outstanding and the restaurant less formal than some in the larger hotels. The atmosphere is more rustic, resembling a wayside tavern rather than a nawab’s dining room. Tel: (011) 301-0211. Fax: (011) 301-0625. Gaylord offers Mughal and Northern Indian cuisine in plush surroundings – armchairs, chandeliers and gilt mirrors – give the establishment a slightly somber feel, popular with predominantly male, middle-class and middle-aged clientele. 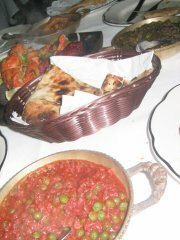 The food is prepared in the traditional style, rich and filling – the nurg bharta is particularly good. Gaylord lends itself to the business lunch. Tel: (011) 336-0717 or 373-4677. A staid restaurant in Connaught Place, The Host offers Mughal and Chinese specialties to mostly Delhi businessmen and well-heeled tourists. The food is good if a little simple and, in the case of the Mughal dishes – bhuna murg, for example – filling and rich. The Spice Route in The Imperial hotel offers high-quality Thai and South Asian food, in a restaurant adorned with antique, gaudily painted wooden pillars and panels. Even if the food were not delicious– crisp, spicy and fresh – it would still be worth eating here for the atmosphere alone. The tangy piquant vegetables stews, and oriental salads are particularly recommended. Tel: (011) 334-1234. Fax: (011) 334-2255. A small, nicely decorated and simple restaurant in Khan Market, China Fare is popular among expats. It serves delicious Chinese food, prepared Indian style (spicy and hot) at reasonable prices with friendly service. Open since 1913, Karim’s is a Delhi institution. It serves Mughal food in basic but clean surroundings off a courtyard behind Jama Masjid in Old Delhi. The tandoori chicken is highly recommended. The bird is surprisingly served whole and spread-eagled but is quite delicious. Tel: (011) 326-9880 or 326- 4981. Attached to the Taj Mahal Hotel, Machaan, a 24-hour café serves a variety of styles of asian and European food, including Vietnamese, Thai, and Italian, on a continuously changing basis. It is a place to eat quickly and well for a reasonable price – the food is served buffet style, and the restaurant has recently been renovated. 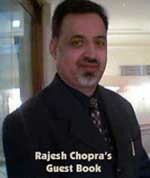 Sagar Ratna, in the Lodhi Hotel offers southern Indian vegetarian food. The dhosas, idlis and uphapams, light yet filling, is a delicious alternative to the omnipresent Mughal food. The restaurant is large, which is fortunate, as it is very busy. The service is excellent and The sister restaurant in Defence Colony Market is more rough and ready but equally as good. A new restaurant in Defence Colony Market, Swagath offers mughal, Chinese, and southern Indian cuisine in a serene, stylish atmosphere spread over four floors. Its specialty is seafood, including various fish gassis, fish sawantalis and fish malbaris. In season lobster and crab is available. 14, Defence Colony Market, New Delhi. Tel: (011) 465-4537 or 4538. Turtles café is above The Full Circle bookshop in Khan Market. It is a nice place to read over a cup of coffee or to take a light snack lunch – a quiche or pasta bake. The café offers scones and cakes too and is popular with expats of all ages.